​Our parish, St. Dominic Church in Washington, DC, is under the Archdiocese of Washington but run by the Order of Preachers, popularly known as the "Dominicans." The Order of Preachers is a religious order within the Catholic Church founded by St. Dominic in 1216. The Dominican family consists of the friars preachers, cloistered nuns, active sisters, and lay Dominicans. Click on the following link to find a timeline of the life of St. Dominic. Click in turn on each date on the timeline to read about the events in the life of St. Dominic associated at that particular time. The windows in our church beautifully trace the life of St. Dominic from his birth to his death and canonization, beginning by the St. Joseph statue and ending by the Our Lady of Rosary shrine. A different Dominican saint or blessed is depicted underneath each event in the life of St. Dominic. Click on the following link to read about a brief overview the five major elements in the Dominican Way of Life. Click on each individual element to learn more about that element. The following handout provides a brief overview of Dominican facts, heritage, spirituality, and saints. The Dominican Friars: Why Are We Here? 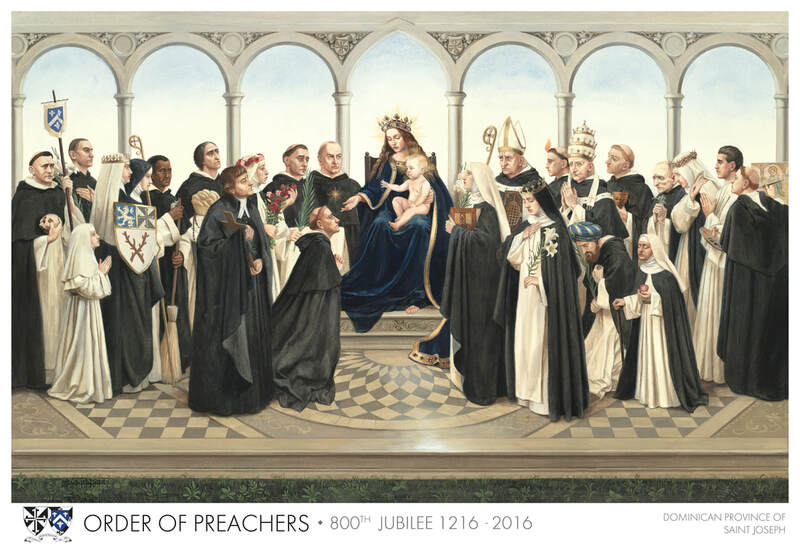 All Saints and Blesseds of the Order of Preachers, pray for us!